Anatomy of teeth is developed through coalescing of various lobes. For example, bicuspids are generally formed from two lobes and molars from four lobes. When individual lobe coalesces to form teeth, they usually create deep fissures where food and bacteria can thrive and cause cavity or demineralization of tooth structure. 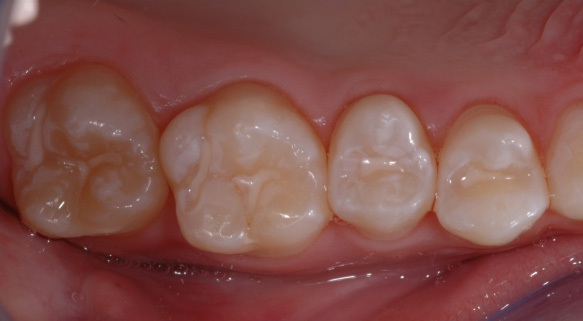 This photo shows stains or possibly carious lesion on the fissures of the first molar. Fortunately, the discoloration on the first molar is deep pitted stain and non-carious. All stains were removed prior to placement of sealants to make certain that nothing is inadvertently left behind. In a 15 year study, sealants have been shown to decrease the development of cavity in posterior teeth by seven-fold compared to those of unsealed teeth. 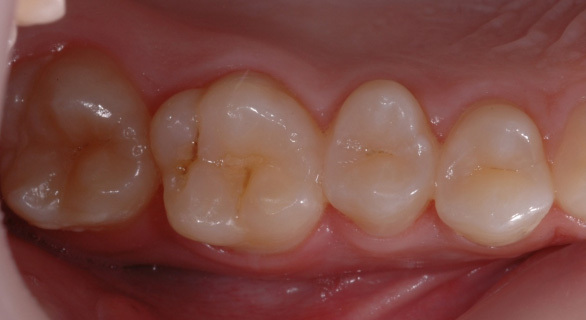 It is by far the most affective way to protect posterior teeth from developing cavity.